Styling your little girl’s hair shouldn’t be a struggle, even if you want to try something completely different every day of the week. The following tips and tricks will help you create some of the best and most popular little girls hairstyles to date. Whether you’re looking for braided hairstyles for little girls, or a new take on buns and ponytails, we have them all for you. 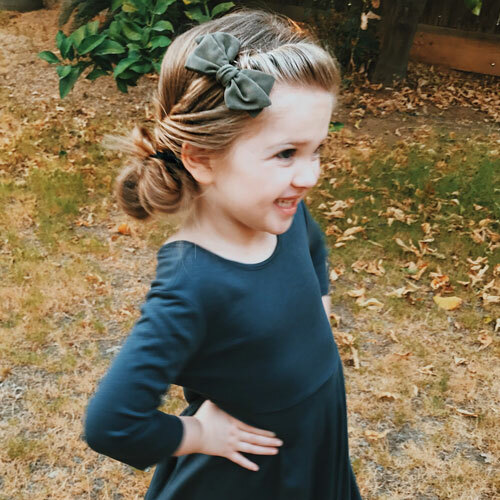 Look below for adorable little girl updos and tips to make them your own. First things first, before you dive in and start styling, it may help quite a bit to have the following tips on creating the best little girl hairstyles. Though it might seem like brushing your little girl’s hair immediately after a bath is ideal, it’s best to avoid it. Brushing wet hair can make tangles worse, and because wet hair is weaker, it’s more prone to breakage. If you want to detangle post-bath, use a good detangling spray (Baby Zen works wonders), then use a wide-tooth comb. To properly towel dry your little girl’s hair, don’t scrub at it. Instead, gently pat it mostly dry or wrap the towel around her head much like you would after a shower, or simply use a hair towel wrap. Blow drying is okay occasionally, but repeated use of heat could weaken her hair. Finally, when it comes to buying the supplies you’ll use to hold updos in place, don’t use normal rubber bands or ties with metal crimps. Use snag-free ponytail holders, instead. It’ll help prevent tears, and they’re much easier to remove, too. Finding the right hairstyle for you and your little one is half the battle. Once you have found the hairstyle you love and made your routine, you can make each day special and unique with different hair accessories. From bows and headbands to clips and flowers, you can make the same hairstyle new every day. Not all of the cute little girl hairstyles you see on Pinterest or Instagram are difficult. 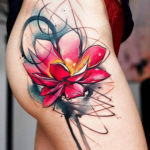 In fact, some are incredibly easy for you to do at home yourself. If you are looking for an easy go to, the half updo is perfect hairstyle for long or short hair. With half-updos you have endless different hairstyles that take half the time and hassle. Whether you choose a messy bun, top knot, double bun or ponytail they are all adorable and easy to obtain as a half-updo. If your long-locked little one wants something new, try pulling half her hair up on top of her head in a ponytail, then looping it back through the ponytail holder about halfway. Finally, pull out on the bun to shorten the tendrils left behind and you’ll have a half-up, half-down messy bun that’s as adorable as it is functional. If you need to keep your little girl’s hair back for a practice or sporting events, this is one of many little girl hairstyles that will keep things manageable. To obtain this look, gather her hair into pigtails high up on her head, then wrap each pigtail around in a spiral and secure the ends with a clip or a second ponytail holder. 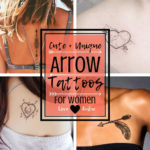 Little girl braids are incredibly popular these days, and some of the best styles are easy enough to create at home with nothing more than a couple of bobby pins or a few ponytail holders. 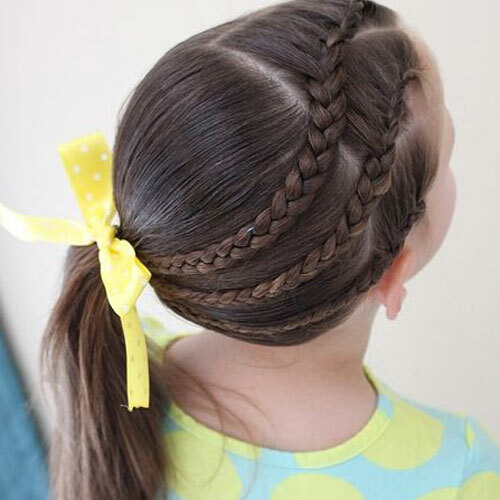 There are hundreds of video tutorials available to learn all of the different styles of braids for your little girl. Plus, practice makes perfect and who doesn’t love having their hair played with! 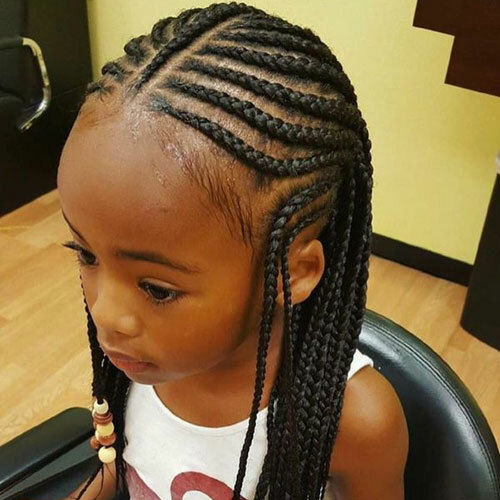 If you have some time on your hands for creating little girl hairstyles at home, goddess braids are a great choice. These resemble cornrows but are much larger, and they can be patterned in any number of ways, pulled into an updo, and more. This one’s easy enough to do. Just start at one side of her head just above her ear and French braid your way to the other side. Secure the end of the braid just under her hair in the back so it’s not noticeable. You can leave the rest of her hair down or take it a step further by incorporating the ends of the “headband” into a French braid or pulling her hair up into a bun. After pulling your little girl’s hair into a high ponytail, simply wrap it around itself a few times and pin it with one or more bobby pins. This sleek look is perfect for little ballerinas and girls who like playing in the dirt alike. Also, to make your life easier you can always use the bun sock to accomplish this look fast and perfectly. A low bun makes this hairstyle a little more fun and informal with just as much attitude. Accomplish this look by following the same steps but near the nape of the neck. As always, using hair accessories will add a special touch to this hairstyle. Cute little girl ponytail hairstyles range from simple and elegant to messy and fun. Whether you want a side ponytail, pigtails, a bubble ponytail, or braids incorporate into your pony, the options are limitless. The wrapped ponytail takes the simple old ponytail up a notch. This ponytail hairstyle is actually very simple. Start of with your little one’s ponytail, take a section of her ponytail (about one-quarter the thickness of her hair) and wrap it around the base of the ponytail several times. To finish, tuck in and secure the wrapped hair with a bobby pin. You can even take this quick trick and apply it to a classic bun hairstyle for a special little touch. Keep a small portion of the hair out of the ponytail before twisting your bun. Once your bun is secured, twist the section of hair you kept out, wrap and secure it around the base of your bun for an elegant look. Finally, another super-easy trick to making a ponytail look amazing involves turning it inside out. First, make a ponytail that sits just above the nape of her neck. Then, pull the ponytail holder down two inches, “part” the hair just above the ponytail holder in half, and fit the entire length of the ponytail through the part. The result is a cute twist that looks “inside out”. Another quick tip is to use the Topsy Tail Kit to create this look in seconds! The options for little girl’s hairstyles are limitless. 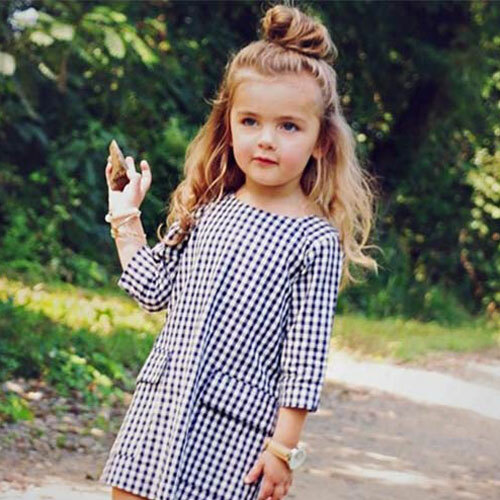 Once you have determined the hairstyles that work best for you and your little one, you can always change it up by adding some accessories, twists, or braids. Also, with some practice you can even accomplish some of these more detailed hairstyles for any occasion.